After a wonderful day yesterday, we got home sort of late. Of course the ride home included stopping in Mammoth Hot Springs to watch the elk forage in the light of coming and going car headlights. And we listened to the bull bugle a little bit - right in the middle of town. After getting home, we didn't stay awake long as the plan was to get up really early and drive out to Lamar Valley heading to the Northeast Entrance. This morning we got up at 5:00 a.m. and were packed and ready to go by 5:30. We tried to gently close car doors and we slowly drove out of the campground with only our parking lights on trying not to wake anyone. However, our attempts to be quiet almost went awry as Linda let out a quick yelp as we passed within a foot of an elk cow standing by the road on one of the campground loops. Yeah, you realize just how big they are when you're that close. We drove up into Mammoth and took the road to Tower-Roosevelt Junction, the first time we had been on that road. It was still dark, so we took it easy and drove about 10 mph under the posted speed limits. Just before reaching the junction, we encountered four or five young Mule Deer bucks in the road. Our second wildlife sighting before dawn. At Tower, we followed the sign to the Northeast Entrance and drove east as it started getting lighter. In the early morning light, every rock and bush looks like an animal. I really didn't know what section of the road we were supposed to be concentrating on, but I imagined we would eventually see a bunch of stopped cars and people with binoculars, spotting scopes, and long-lens cameras. 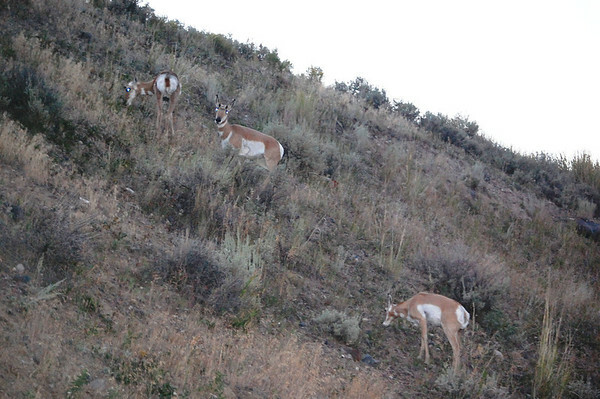 We stopped to let some Pronghorns cross the road. As it got a little lighter, we were able to distinguish distant black dot animals from distant black dot rocks. 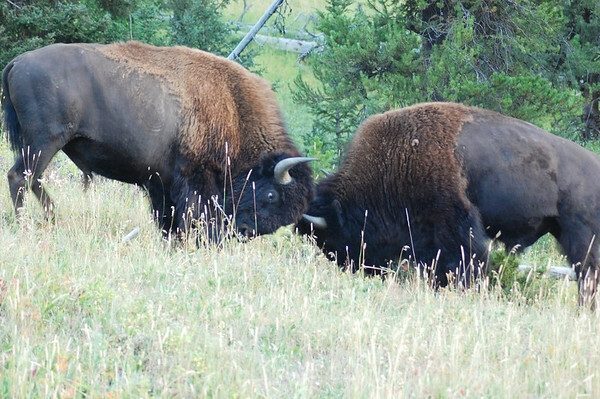 We stopped so Linda could check them out, but they were always lone Bison. We have certainly seen our share of Bison these last few months, so looking at them through binoculars 300 yards away wasn't too thrilling. Eventually there it was. The line of stopped cars and all the wildlife viewing equipment I had imagined. My problem was, in the haste of getting out the door, I failed to grab my sweatshirt or jacket and it was too cold to get out of the Jeep and stay out very long. But Linda got out and joined the group colloquially known as "the wolf people". They track Yellowstone's wolves, have names for each pack, and know the pack members. Ho hum. We got great looks at wolves last night, ... we've seen those. How quickly we become jaded. 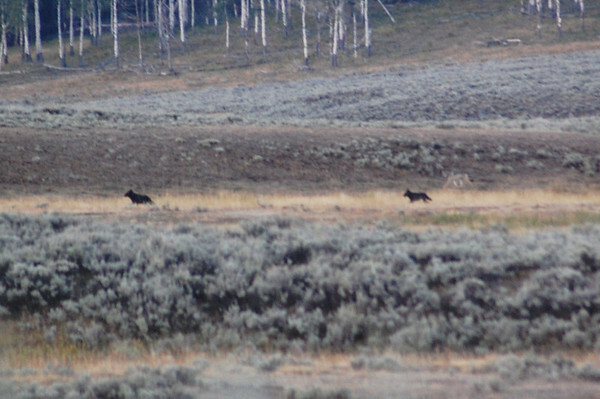 The wolves did come out and we could certainly see them with our binoculars. I brought my biggest lens, but could only get this blurry image from the warmth of the Jeep. Since we had the great fortune of watching wolves yesterday from much closer, we moved on as this morning's hunting party put more distance between us. As we have been since we arrived in the area, we were in search of bears. 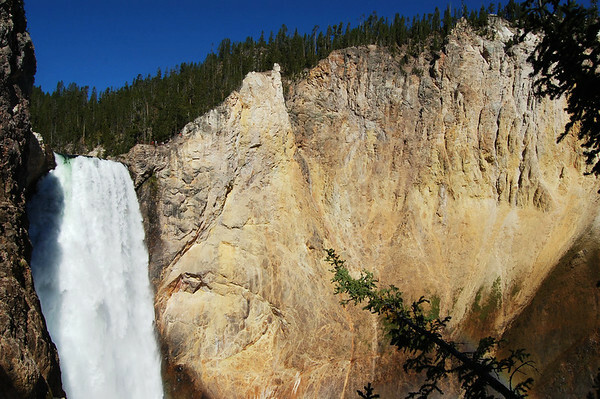 From what I've read and been told, bear sightings in Yellowstone have decreased. Plus, the best viewing opportunities are in the spring when there are more carcasses of poor animals that didn't survive the winter. Still, we stopped and looked at every black dot hoping it would be a large carnivore. When in search of wildlife, you look closely at every vehicle stopped on the side of the road to see if the people have spotted something. Most often they have stopped to look at a map, so you by-pass if they are in the car and looking down. If they have their binoculars out or are pointing, you pay attention. But then it most likely is a very distant Pronghorn or Bison and you realize the people just arrived in the park and don't yet know they will get very close-up looks of both of those animals. However, sometimes someone will have made a great sighting and that's why you have to always take a close look. Reading the people in the parked cars becomes a skill necessary to keep you from 1) wasting your valuable park time, and 2) getting rear-ended when you have to make a split-second decision as whether or not to pull over. We continued driving only to see more Bison. Of course, they are magnificent animals and it can be a lot of fun watching the interactions within a herd. These two were in a little scuffle which was interesting until the battle got a little too close for comfort. We kept driving as Linda continued to scan the woods, meadows, tree lines, and ridges for wildlife. Eventually, long before reaching the park's border, we turned around. 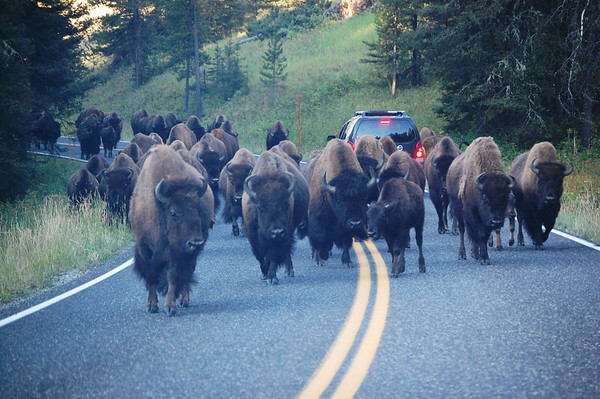 On the way back, our Bison herd had decided the easiest path to their next destination was right up the road. It's one thing when they are slowly walking by, but when it turned into a fast trot, it was a little intimidating with us having no place to go. Fortunately, there were no incidents and we were able to pass through safely. As we continued back toward Tower, we saw that "the wolf people" had moved along with everyone following "the wolf people". With no place to park, we just kept moving. So, we never saw any bears, but it wasn't a bad wildlife morning with mule deer, elk, bison, wolves, pronghorn, sandhill cranes, bald eagles, hawks, rabbits, and various other birds. We'd take that any day. I had once again brought my fishing gear thinking I might do some angling in the Lamar Valley. But, without proper outerwear and the temps still being quite chilly, I bagged that idea. 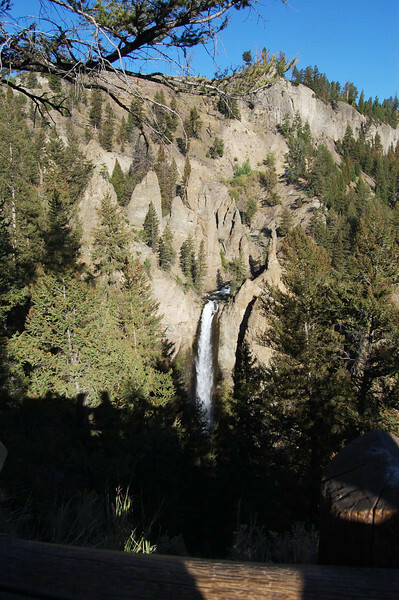 Instead, we decided to go to Tower Falls and then on down to Canyon to revisit the Upper and Lower Falls of the Yellowstone River. 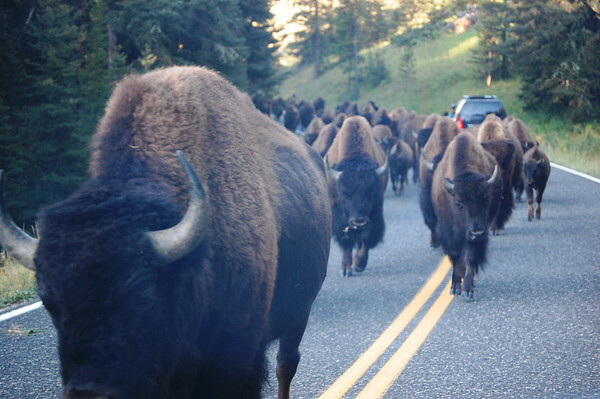 Now that 19-mile road is the one road in Yellowstone that we've been warned to avoid in an RV. Not only are there twists and turns, but it is quite a climb up to Dunraven Pass/Mt. Washburn from either direction, and it is a long, steep descent with a six mile stretch of 7% grade going down from Mt. Washburn toward Tower. And right now it is even worse due to construction in the Tower Falls area. They are stopping traffic for several minutes at a time, and the one lane road is very, very narrow. Of course, it's always a good idea to check out the park's Alerts page for road construction. You can avoid some delays by getting updates there. The good news is they are trying to improve the roads for today's larger, heavier vehicles, and there are more turnouts for larger vehicles than in days past. 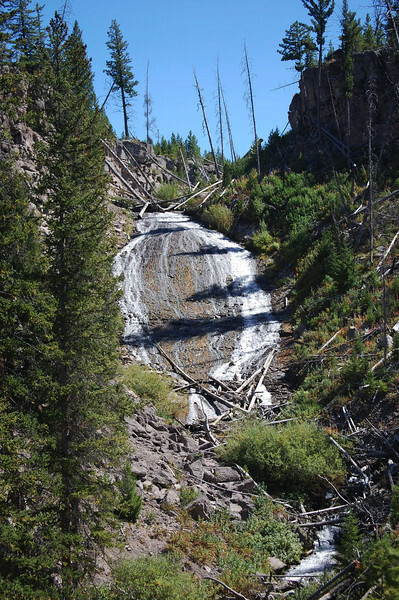 After sitting a few minutes, we were allowed through the construction and we made a quick stop at Tower Falls. 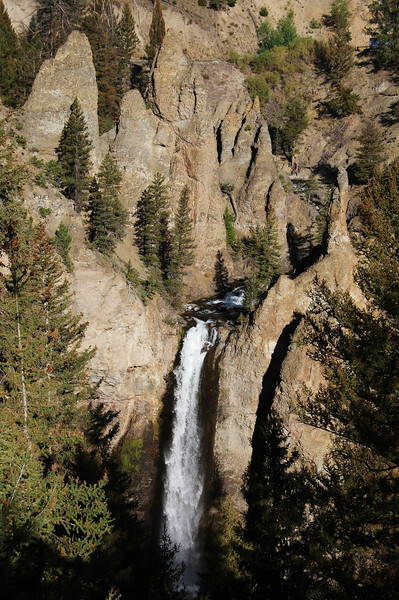 It's a distant view from the overlook, but it is a lovely waterfall with interesting formations around the top. From there we made the ascent up toward Mt. Washburn. It is a twisty road with beautiful views. The Mt. Washburn hike is one that is highly recommended for the views and the possibility of seeing bears (we met someone that saw a black bear and two cubs). 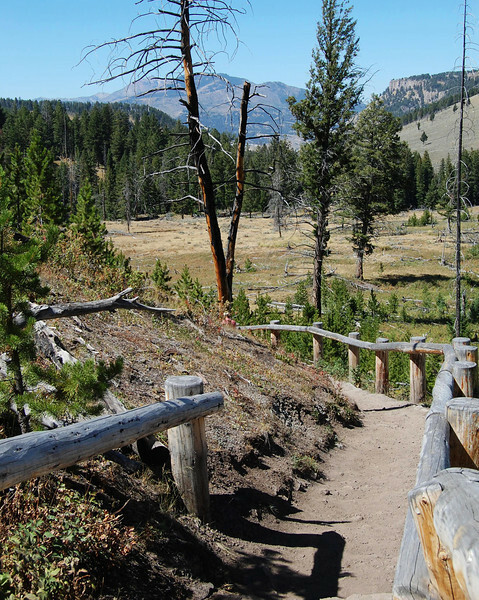 There are two different trailheads making for either a 5-mile round-trip or a 6.2-mile round-trip. However, it's a 1400 foot vertical rise. We drove up a gravel road (Chittenden Road) to one of the trailheads hoping to spot a bear along the way. I got out and with the cold wind quickly decided we weren't doing any impromptu hiking today. Of course, we're not ready for a hike to 10,200 feet right now no matter how prepared we were clothing-wise. 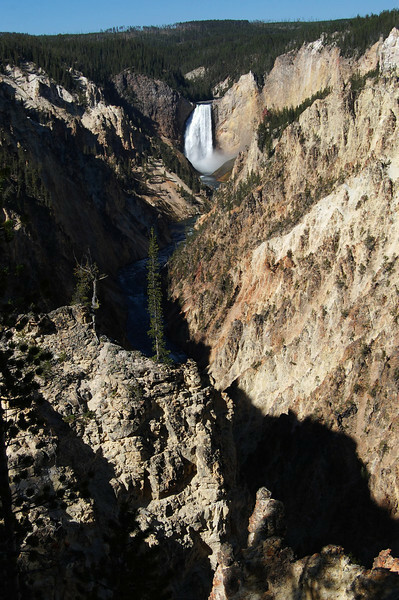 We descended into Canyon and drove directly to the South Rim of the Grand Canyon of Yellowstone. 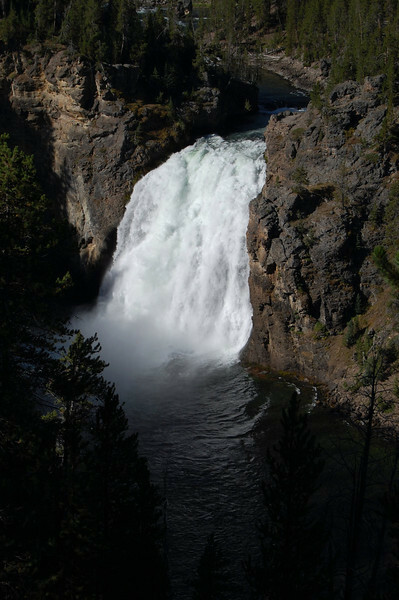 We parked at Uncle Tom's Point and walked over for a view of the Upper Falls. Then we drove a mile down the same road to Artist Point. 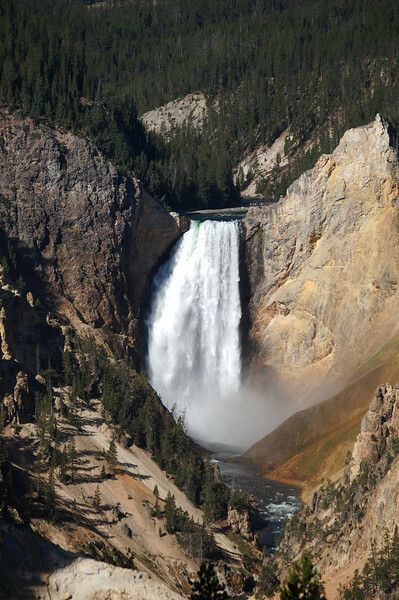 The last time we passed through the area, I had no idea you could view the Lower Falls from there. In fact, there are several great viewpoints from Artist Point. 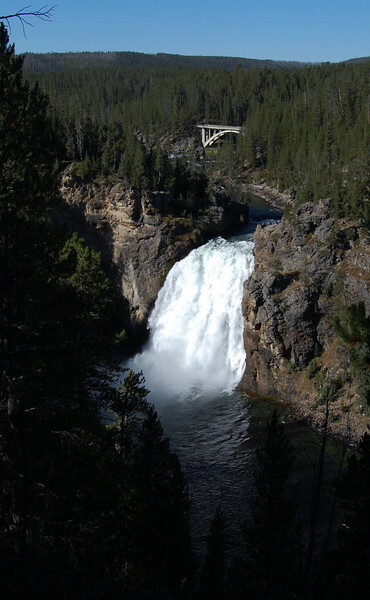 The Lower Falls are gorgeous. Before we left, I spoke to the roaming ranger, Kirk. 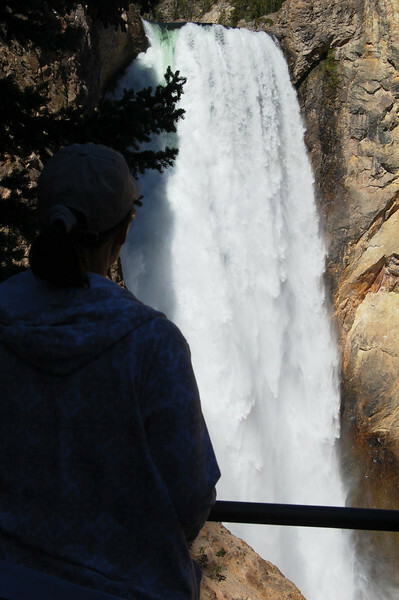 He has been a full-time RVer for 10 years and he is an official seasonal employee (not a volunteer) with the National Park Service. He works in Yellowstone in the summer and the Everglades in the winter. Nice gigs. I asked about walking down into the canyon from the north rim for a view of the falls from Red Rock Point. He suggested that the views and colors are better in the morning from Uncle Tom's Trail which goes three quarters of the way down from the south rim. I hadn't read about that option. So, we went back to Uncle Tom's Point and took Uncle Tom's Trail. 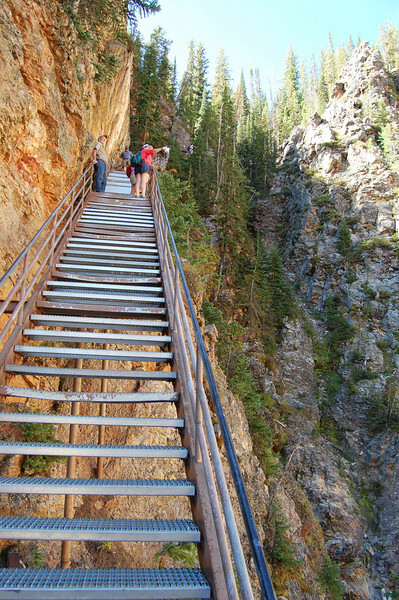 The trail descends along a paved path and then incorporates 328 steps. Yes, the views were quite good from down there. 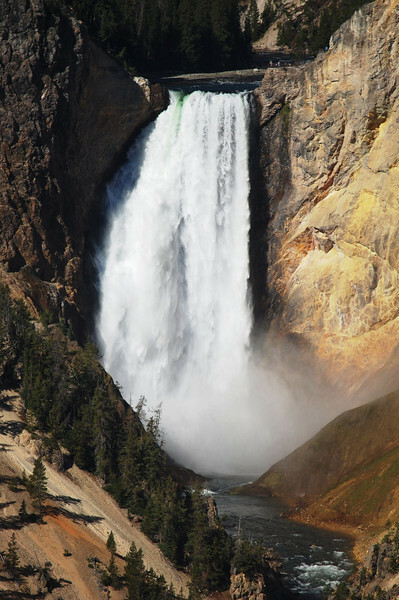 The Lower Falls are 308 feet and can be viewed from the north rim at Lookout Point, the south rim at Artist Point, or from down in the canyon at Red Rock Point hiking down from the north rim or at Uncle Tom's Trail hiking down from the south rim. This time of year, it looks like between 9:30 and 10:30 a.m. is the prime viewing range. We walked back up all those steps with Linda using each landing as a goal and rest stop. We considered doing either the North Rim or the South Rim Trail, but we decided instead to head on back toward Mammoth. We went back by way of Tower and endured the construction. Then, since it was dark when we traveled from Mammoth to Tower this morning, we decided to take in some of the sights along that stretch. We drove the six-mile, gravel, one-way Blacktail Plateau Road. It gets a little traffic, but not nearly as much as the main roads. Unfortunately, we didn't see any wildlife at all. Next, we stopped at the Wraith Falls Trailhead. It was a one-mile round-trip hike. Not bad, but I suspect it would be a lot better in the spring during snowmelt runoff. The view on the way out was actually better, in my opinion. 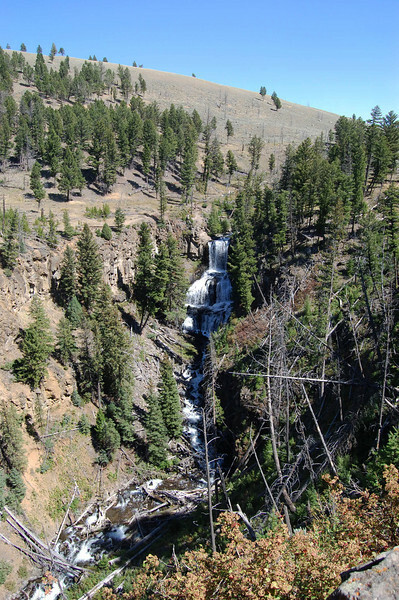 Just a little farther down the road toward Mammoth was Undine Falls, a larger, more attractive waterfall with a roadside overlook. We would have liked to have found bears, but we still had another great day of wildlife and waterfalls.